First Appearance: Adventure Comics (vol. 1) #61 (Apr. 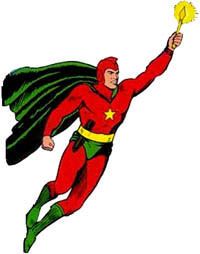 1941): "The Amazing Starman"
All-Star Comics (vol. 1) #8 (Dec. 1941 - Jan. 1942): "Two New Members Win Their Spurs"
The Brave and the Bold (vol. 1) #182 (Jan. 1982): "Interlude on Earth-Two"
DC Heroes Secret Files & Origins #1 (Feb. 1999): "6 Degrees of the DCU"
Justice Society of America (vol. 1) #1 (Apr. 1991): "Beware the Savage Skies!" 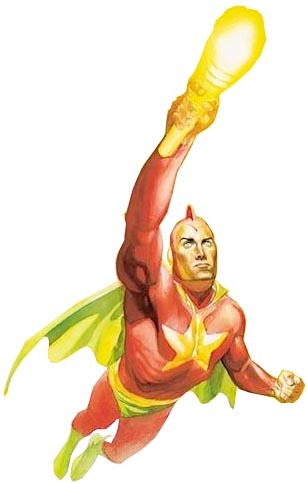 Justice Society of America (vol. 1) #2 (May 1991): "The Sack of Gotham"
Justice Society of America (vol. 1) #3 (June 1991): "Dead Air"
Justice Society of America (vol. 1) #7 (Oct. 1991): "The Return of the Justice Society"
Justice Society of America (vol. 1) #8 (Nov. 1991): "Battle of the Stars!" Justice Society of America (vol. 2) #1 (Aug. 1992): "Home Again"
Justice Society of America (vol. 2) #9 (Apr. 1993): "Hearts of Darkness, Eyes of Hate"
Justice Society of America (vol. 2) #10 (May 1993): "JSA No More?"